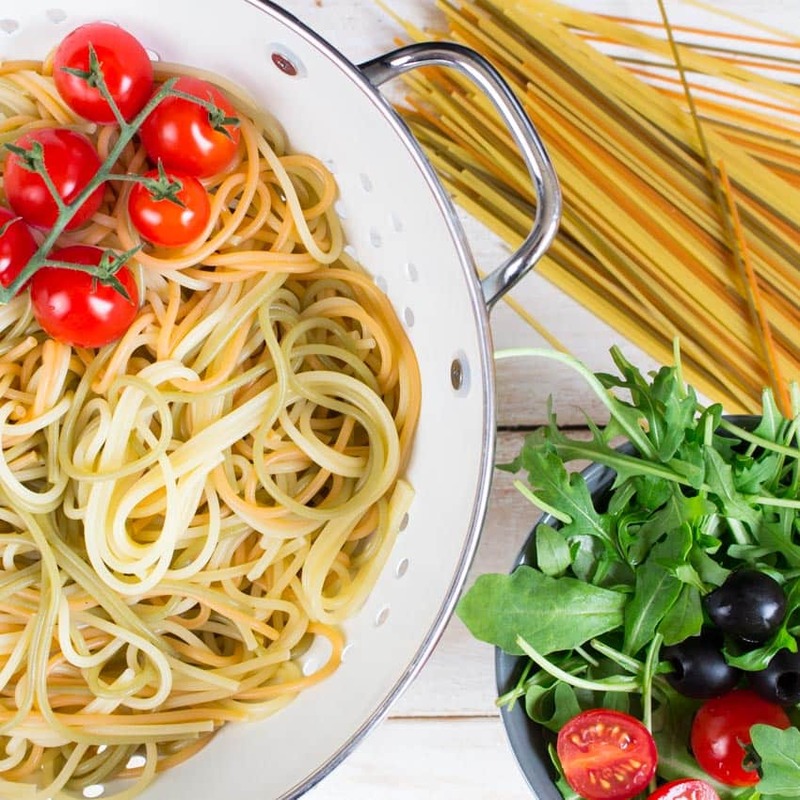 I’ve always loved pasta and I really don’t know what I like better: warm pasta dishes or pasta salad. I think the special thing about pasta salad is that we don’t have it very often (most of the time we only make it for parties or BBQs), so I’m always getting quite excited about it. 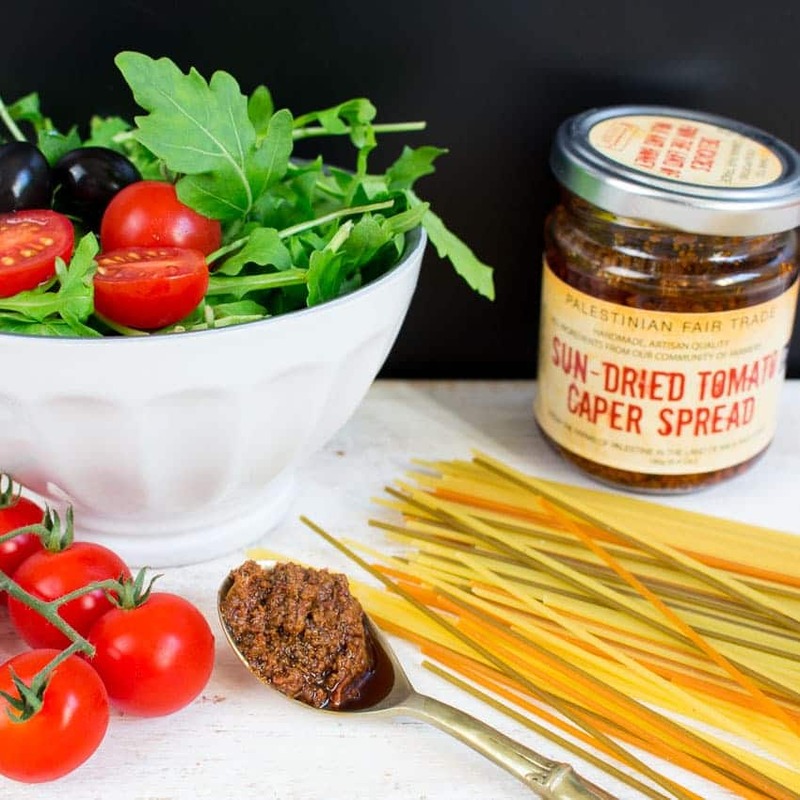 When GlobeIn sent me one of their Artisan boxes to review and it contained a jar of sun-dried tomato caper spread and a box of thyme with roasted sesame seeds, I knew right away that this would make a perfect vegan pesto pasta salad. I also added arugula, cherry tomatoes, and black olives. To give the pesto salad a bit more color, I used tri-color spaghetti, but of course you can also use regular or whole-wheat spaghetti. It’s already getting colder here, so we only enjoyed the salad together with roasted bread, but it would also be a great side dish for BBQs and picnics. It’s super easy to make and comes together in only 20 minutes. But probably you’re already wondering what I meant when I mentioned the GlobeIn Artisan box. Globe In is a shop that features products sourced from direct relationships with artisans from all over the world. By selling these products, GlobeIn supports artisans in developing countries where, after agriculture, artisan goods are the second largest source of employment. 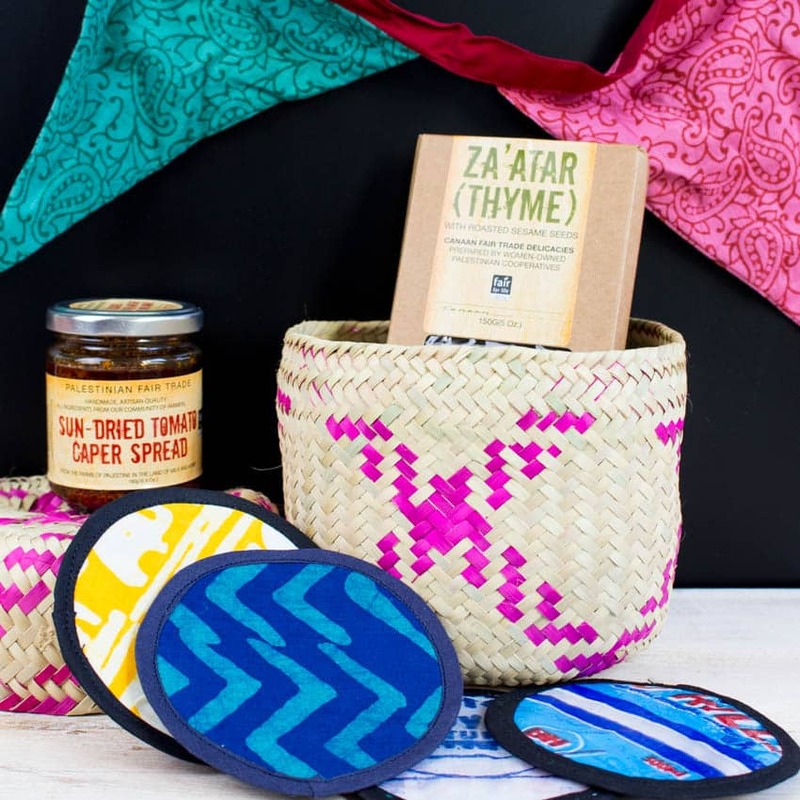 You can either buy these Artisan products separately in their online shop, or you can subscribe for a monthly box full of handcrafted, organic, and fair trade products for 30 dollars per month. Each box has a different theme. For example, the box I got has the theme “Entertain”. The vegan sun-dried tomato caper spread can either be served as a dip, on warm bread, or with pasta. I’m really in love with the Za’atar Spice Mix. I’ve never heard of something like this before. 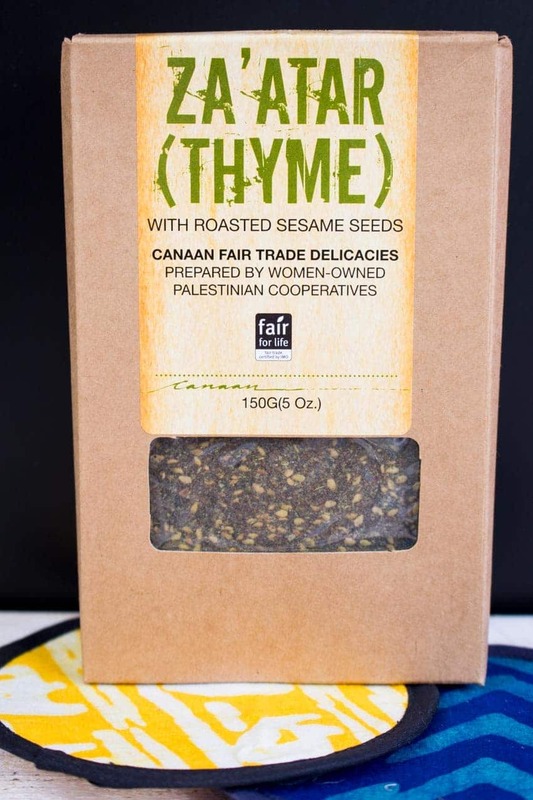 It’s a combination of dried thyme, wild sumac, cold pressed olive oil, and roasted sesame seeds. 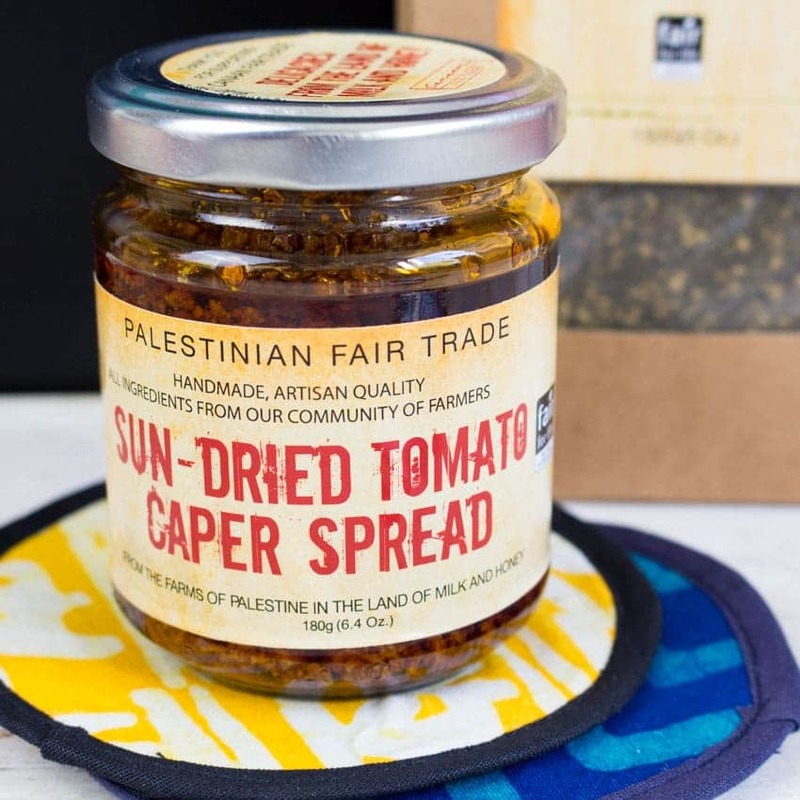 Besides the tomato caper spread and Za’tar Spice Mix with sesame seeds from Palestine, it also includes coasters from Ghana that use discarded plastic bags, a tea time bunting from India, and a palm leaf basket from Mexico. All of the products you can find in the Artisan box are made through projects that help women support themselves and climb the economic ladder through meaningful work. Previous themes were picnic, wellness, refresh, and bake to name just a few of them. I especially liked the tea time bunting that is made from upcycled Indian saris. Unfortunately, we don’t have a birthday coming up soon, but I think these would make a really great decoration. All in all, I really liked this idea and I can assure you that you won’t get a box of junk or stuff that you won’t need. I recently subscribed for a monthly box of vegan things (not a Globe In box though, but almost all their products are vegan too) and I’m always getting so excited when I open it. It kinda feels like Christmas not knowing what’s in there. If you want to sign up for a monthly GlobeIn box, use the coupon code VEGANHEAVEN to get 25% off your first month’s box with a 3 or 6 month subscription. But back to the spaghetti salad. If you don’t like arugula (I know some people don’t, I also just recently began to love it), you can also sub it with fresh baby spinach. Instead of the sun-dried tomato and caper spread that I got from GlobeIn, you can also use homemade pesto. I included a recipe for sun-dried tomato caper pesto further down in the recipe section. Of course you can also serve the cold pesto pasta salad warm and top it off with fresh arugula. This vegan pesto pasta salad with arugula, cherry tomatoes, and black olives is perfect for BBQs and picnics. It comes together in only 20 minutes! Place them in a salad bowl and stir in the tomato caper pesto, the olives, the tomatoes, and the arugula. Season with salt and pepper and sprinkle with the Za'atar Spice Mix with roasted sesame seeds. 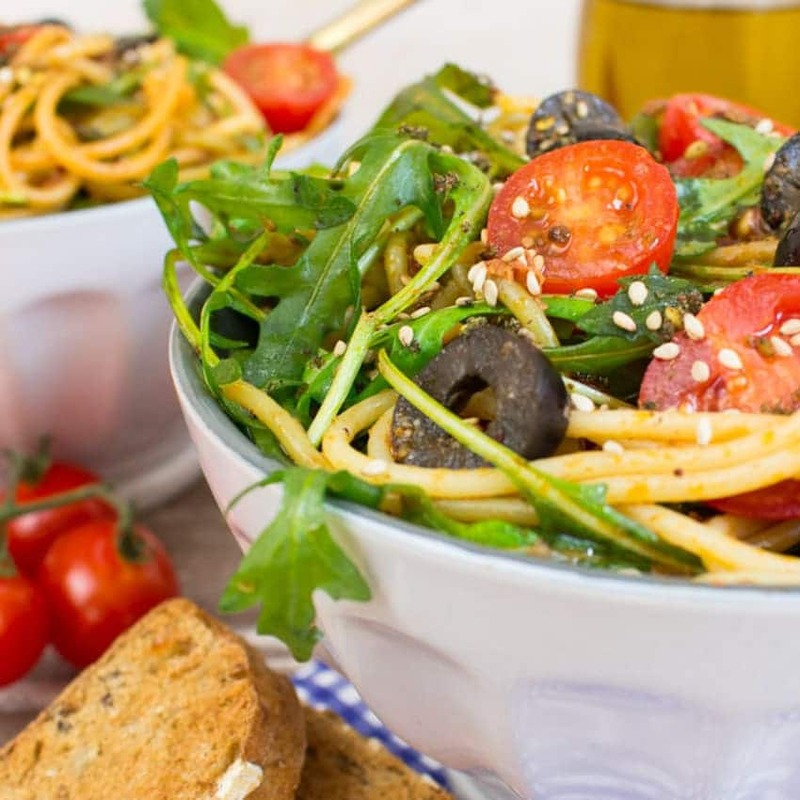 If you are not using the above mentioned pesto or spice mix from GlobeIn, make the homemade version of the pesto while the spaghetti are cooking. Place the sun-dried tomatoes and capers together with olive oil in a blender or food processor and process until smooth. Season with salt and pepper and combine with the remaining ingredients. Sprinkle with roasted sesame seeds and add 1/2 teaspoon thyme. That spread sounds lovely! I adore sun-dried tomatoes and that smokey sweet/savory taste they have! Oh wow! I am loving this pasta salad. So vibrant and delish and YUM! Absolutely delicious! Oh what a pretty salad! I love the pesto in here. Sounds like the perfect lunch! Thanks, Gayle! :-) It really is perfect for lunch and it’s so easy to make. YUM! I could use a huge bowl of this right now! OMG this looks so delicious!! GORGEOUS pictures, btw! Thanks for sharing! This looks so good! I love tomatoes and I could eat them everyday, as well as pasta. Thanks for sharing! I love this recipe for pasta because it isn’t to fating because of the sauce. Thanks for sharing. Oh yaaaa bring on the tomatoey pesto baby! Okay, so I didn’t actually really dig pasta salad until this last year really. I think the more flavor the better with pasta salad, and now I’m in love. And this one is screeeeeaming flavor. So you know what that means? Yum Sina! Yum! Thanks, Meg! I totally agree with you! :-) I love love love pasta salad!! And the tomato caper pesto definitely gave it tons of flavor! Love this pasta salad! It looks so colorful and vibrant! That sun-dried tomato spread sound amazing! Thanks, Kelly! :-) The spread really is amazing! I could just eat it with a spoon right out of the jar! Beautiful looking salad! Also get some pasta as well. The colors in this salad are beautiful! And I personally love the arugula in there! Thanks, Harriet! :-) I hope you enjoy it. I’ve always loved capers, but I’d never thought of adding them to a pesto. So glad I got this idea from GlobeIn. Wow, this looks so delicious! 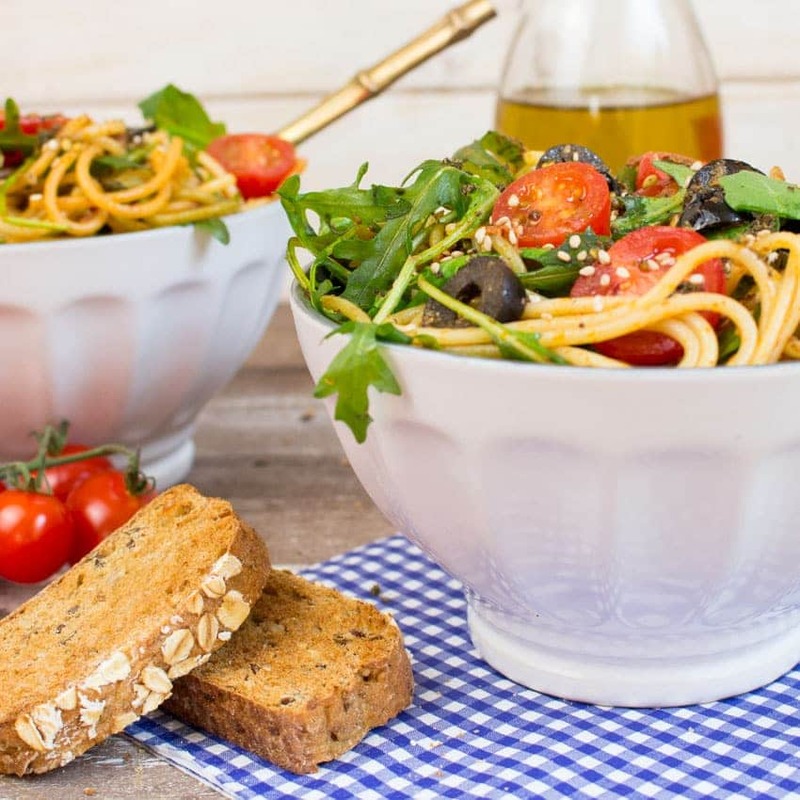 I usually eat pasta and salad together, so what a brilliant idea to just combine the two! I love how you used sun-dried tomatoes in this dish. They’re so flavorful and delicious in pasta and I think I even have a jar in the pantry! Can’t wait to give it a try! I love pasta salad! And I can’t imagine anyone not liking arugula. I love it. And sun dried tomato caper pesto sounds amazing. Thanks, Debbie! So glad you like it. I don’t know why, but I hated arugula for years. ;-) The same applies to olives, but now I can’t get enough of both!! It’s so weird how your taste can suddenly change. So glad you like it, Stella! :-) Thanks for sharing! What a fabulous tasty salad, we’re big fans of za’atar in this household and love all the flavours going on here! I love pesto with tomatoes, so I can imagine how delicious this salad is! Yum!! Thanks, Jenn! :-) I love how simple the recipe is and I could just eat pasta every day!! Your salad looks so bright and appetising, I could devour it down right now. Za’atar is delicious as sounds that red pesto. Thanks, Choclette! :-) Glad you like it! I love how bright and simple this pasta salad is Sina!! It’s beautiful and I love the pesto on top. I bet the flavors are so bold and smell delicious too. I love that you added arugula too, I love arugula so much because it’s so peppery! Thanks, Brandi! :-) I used to hate arugula for years, but now I can’t get enough of it! I love supporting companies that support people in third world countries. It feels good. The pesto salad looks so good. And I love the products that they sent to you. It really is a great concept, Linda! And I love the products I got. :-) They also sent a little brochure in which they explain where the products came from and who made them. This looks so good!! I love a good pasta dish and this ones sounds amazing. And I just love arugula! It’s one of my faves!! Thanks, Sophia! :-) I used to hate arugula, but now I can’t get enough of it anymore! I love the big flavors in your salad, especially the za’atar. I never thought of using it in a pasta salad but that’s genius. Thanks for this great recipe, Sina! That bowl of pasta looks so fresh and inviting! I could just dive right in! It’s great for packed lunches too. Your photos are pretty great too! Thanks, Mel! :-) I actually doubled the recipe and we had it for lunch the next day, so easy and yummy! I love pesto pasta, love the fresh, vibrant colors. I love Za’atar spice! 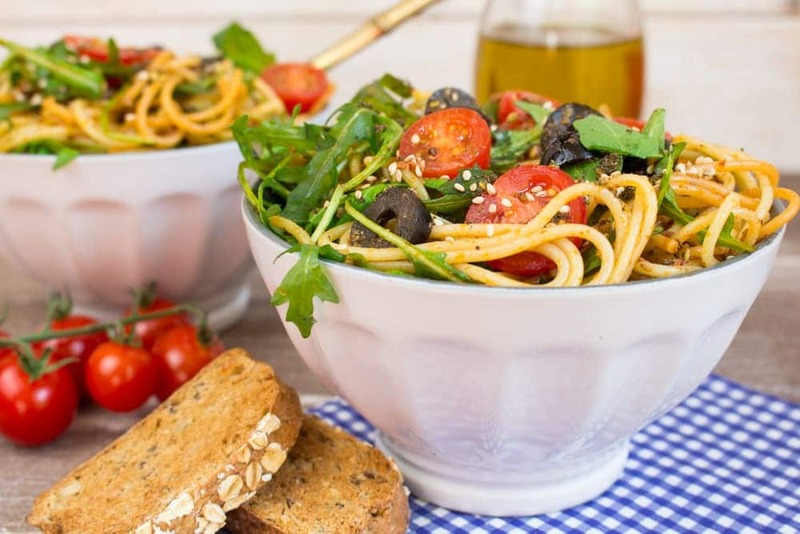 Super vibrant, super gorgeous, super healthy = the perfect pasta salad I’d say!! Mmm.. Sun-dried tomato and za’atar pesto sounds insanely delicious. What a gorgeous quick meal! What can I use instead of capers? I don’t think even the fruit and veg shop sells them where I live.